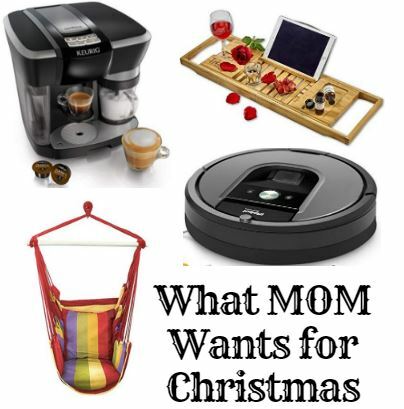 What Mom Wants for Christmas – Picked by a Mom! Well, I am here to help. I am a mom so I feel qualified to give advice. Not every mom is going to like every item on this list but if you know your mom well, then maybe something on this list will trigger an idea. YES! I want a robot vacuum cleaner! What mom wouldn’t want someone (even if it’s a robot) to take over one of her jobs?? A robot vacuum would make my days a lot easier! But it’s also $700. There are more affordable versions. I would be thrilled with any of them. The iRobot Roomba 890 Robot Vacuum Cleaner comes in under $500. And the iRobot Roomba 690 Robot Vacuum goes on sale for $299.99 regularly. Or the iRobot Roomba 614 Robot Vacuum Cleaner, Self-Charging that is currently just $269.99. 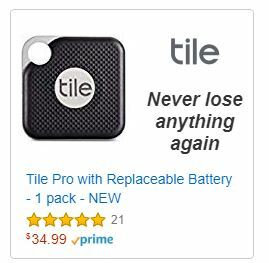 But there are other brands besides the Roomba that have good reviews and cost even less. eufy BoostIQ RoboVac 11S (Slim) is $229.99, has a 4.3 star out of 5 customer review rating and is Amazon’s #1 best seller in robot vacuums. The ILIFE V3s Pro Robotic Vacuum, Powerful Suction Tangle-free, Slim Design, Auto Charge also has a 4.3 star customer rating and is only $159.99. I am not even kidding you right now. I want a bathtub tray. Especially if it comes with a promise of one hour of uninterrupted bath time. You can find several options on Amazon for under $30 making this a not-break-the-bank gift! 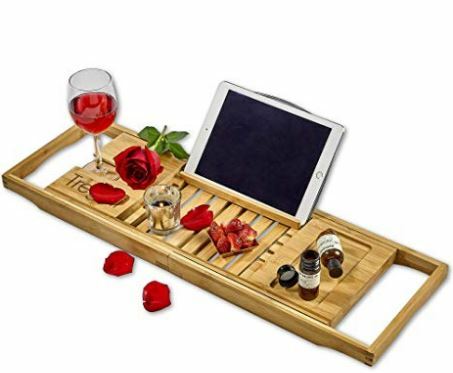 The Tregini Luxury Bathtub Caddy – Extendable Bamboo Wood Bath Tray with Adjustable Book, iPad or Kindle Reading Rack – Wine Glass Holder – Cellphone or Tablet Slot (pictured above) is under $30. The ROYAL CRAFT WOOD Luxury Bamboo Bathtub Caddy Tray, Free Soap Holder (Brown) is $40 but really nice with great reviews! Don’t forget a pillow for the bath! You really want some mom brownie points? Spring for the QuiltedAir BathBed Luxury Bath Pillow and Spa Cushion for Full Body Comfort! Help make mom’s life a little easier by helping her keep up with her stuff with a Tile! Letter Boards are all the rage right now. And I have one on my Christmas list! Maybe you know someone that would like one for Christmas? 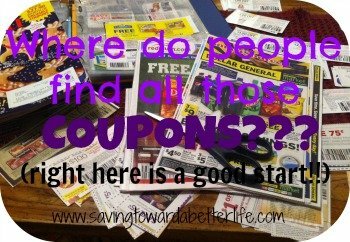 The great thing is that there are options that aren’t all too expensive! Felt Letter Board 10×10 with Attached Stand, 346 Changeable White Plastic Letters, Storage Drawstring Canvas Bag, Wall Mount Hanger, Free Scissors | Gift Box | Oak Frame | Home & Office | (Gray) – at $19.99 this is a great budget gift! Yes, really! I would love one of these Hammock Chairs on my front porch for reading on nice days! They aren’t as expensive as you think, either! There are some highly rated brands on Amazon for under $30! And others under $40. No where to hang one up? You can purchase a stand! 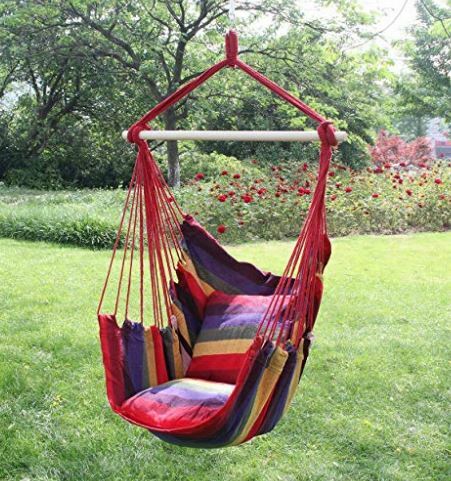 Then you can literally put your Hammock Chair anywhere! I want a machine that will steam milk for me. 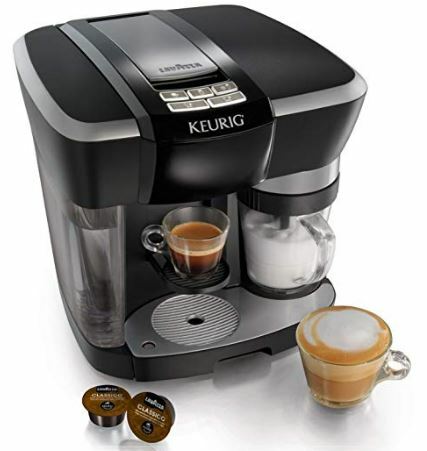 So the Keurig Rivo Espresso, Cappuccino & Latte System is high on my list! The Keurig Rivo System is named after the Italian word for revolutionary. The simplicity of Keurig technology enables you to brew espresso and froth any type of fresh milk at the touch of a button at home. Add Lavazza espresso — with over a century of roasting experience — and you have the perfect cappuccinos, lattes and more. Simple. Quick. Easy. That’s revolutionary! Comes with 12 Rivo Packs included, enjoy this variety pack of Lavazza’s signature blends made exclusively for the Keurig Rivo System. The Mr. Coffee Cafe Barista Espresso and Cappuccino Maker, Silver is a less expensive option that will take Mr. Coffee single serve pods OR regular ground coffee. 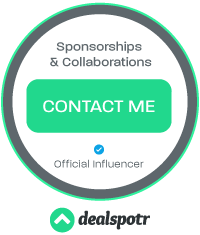 Did you get any good ideas from this list? ?